New Year’s Eve last year, I was introduced to this most peculiar type of drink by a physio colleague of mine who was praising loudly (and still is) about the crazy many health benefits of apple cider vinegar (ACV) (FYI, she also keeps herself to a strict zero-sugar diet and a chemical-free household). So, like many of us sensible people would do nowadays, I went immediately asking the doctor google. One minute later, without a hesitation, I came to decide there were plenty of reliable and valid evidence supporting the “crazy many” added health benefits of drinking ACV. So, it went straight onto my list of 2015 New year’s resolutions. I take 2 tablespoons of apple cider vinegar (ACV) diluted in a glass of cold water twice a day, everyday, 20 minutes before I eat breakfast and dinner. I’ve learnt the fact that ACV is high in acetic acid which helps increase body’s absorption of important minerals from the foods you eat. Therefore, the theory is that drinking in a small quantity in water just before meals would improve the body’s ability to absorb the essential minerals locked in foods. Another major reason I drink ACV is the fact that ACV will help reduce appetite, especially the naughty sugar craving after meals. According to online resource (cited: http://articles.mercola.com/sites/articles/archive/2009/06/02/apple-cider-vinegar-hype.aspx), one theory is that by inactivating the digestive enzymes that break down carbohydrates into sugar, thus slows absorption of sugar from a meal into your bloodstream. This gives your body more time to pull sugar out of your blood, preventing your sugar levels from spiking. When purchasing ACV, you’ll want to avoid the perfectly clear, “sparkling clean” varieties you commonly see on grocery store shelves. Instead, you want organic, unfiltered, unprocessed apple cider vinegar, which is murky and brown. When you try to look through it, you will notice a cobweb-like substance floating in it. This is known as “mother,” and it indicates your vinegar is of good quality. The reason manufacturers distill vinegar is to remove this rather murky looking stuff that most folks won’t buy. But in this case, it’s the murky looking stuff you want. As with everything else, the more processed a food is, the less nutritious, and this holds true for apple cider vinegar. It has been 5 months since I’ve been addicted to this crazy morning beverage. If you don’t feel any immediate changes, you will certainly get the wake-up kick in your taste-buds and in your breath, hehe. Now, I don’t really feel the post meal sleepiness, neither feel like an extra bite of chocolate or sugary bikkies with my tea in-between meals, and, certainly my energy level boosted like I am 21 again – woohoo!! So, go on everyone if you are in need for an extra boost of energy, and want to cleanse out (literally) your insides, how about stopping at your local grocery store on your way home today, grab a bottle of ACV and have a go at drinking it while your dinner is getting cooked. 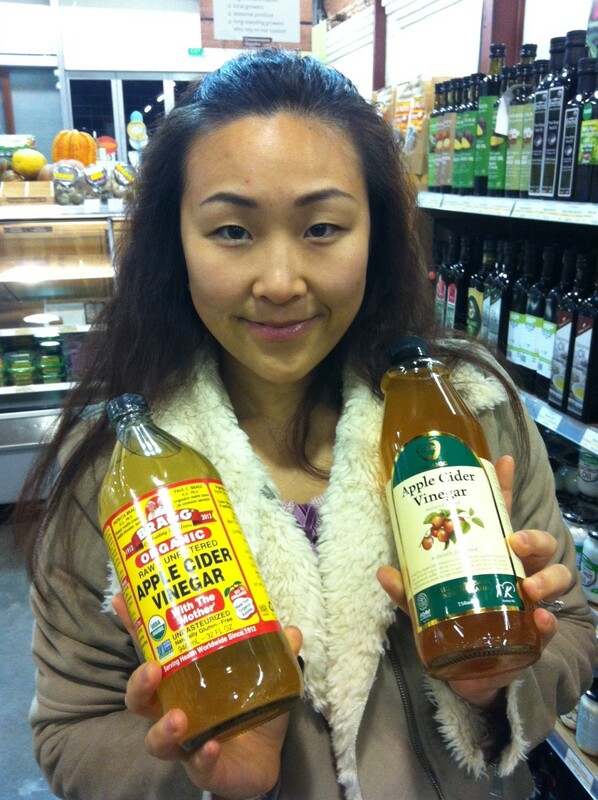 Apple and vinegar – it’s a win:win formula!